I’ve been reading a lot about anguished homeowners recently, who’ve been whipsawed by the subprime crisis and are now mulling their future. In some spots in California, things haven’t been too pretty with the real estate market, thus leading to a rise in foreclosures. And just as easy credit flowed easily not too long ago, fueling the rise in subprime mortgage and “no money down” loans, we’re now seeing the consequential rise in yet another disturbing trend: people simply deciding to walk away from their homes. I can’t imagine what it’s like to face the prospect of losing your house. It’s a financial quandary that has many possible solutions that can depend on your specific situation. If I were in such a position, how would I go about figuring out what to do? I thought I’d put together some arguments and reasonings that go behind making such a huge financial decision — the decision to foreclose or to walk away from one’s home and mortgage. How you decide to resolve your mortgage issues may depend on your personal circumstances, so read on for some points to consider while making your decisions. Why Would You Consider Foreclosure? Foreclosure may seem to be a more attractive option for those people who were caught in the subprime mess as holders (victims?) of 0% money down loans. This is because they have less money on the line — with no equity or no cash tied to your home, you may feel less obliged to hold on to your house. People have different reasons for owning a home. Those who bought homes for investment purposes will have different financial expectations as those who bought homes as primary residences. An investor looking for a quick buck will find it especially tempting to dump a house when faced with the possibility — or worse, the reality — of loss. If you can’t sleep at night and you really just want to bite the bullet and get things over with, then you may be a candidate for “walking away”. Though there are certainly ways you can work things out with your lender, it may be the case that you’d rather avoid the hassle and prefer to face the consequences (bad as they may be) of foreclosure and having this on your record. In some states, like California, once you “walk away” from your house, your lender cannot pursue you for additional funds. This may be a relief to some people who feel pressure and are in deep financial distress. Some mortgage experts have stated that foreclosure is not as devastating as you may think. For instance, you don’t need to declare bankruptcy, which is a different animal altogether. Even with foreclosure, you may be able to restore your good credit standing sooner than you think: think one or two years rather than the often mentioned seven to ten year process. How so? Supposedly, though a foreclosure is a mark on your credit report that stays for seven years, its true effects are mitigated over time: if the rest of your finances are positive, your payments are current and you have no other problems with your status, then your credit score can return to a decent range (e.g. 600’s – 700’s). You may have leverage: banks don’t like to foreclose — each bad loan costs them an estimated $40,000. This has encouraged troubled homeowners to apply pressure on their lenders by strong-arming these lenders into considering reducing their mortgage principal (in line with current appraised values). When backed into a corner, these homeowners threaten to “walk away” and foreclose, hoping that their banks will cave in to their demand of lowering their mortgage obligations. Why Should You Avoid Foreclosure? Most credit advisors and services discourage delinquent homeowners from foreclosing. The prevailing financial wisdom is that you should do everything in your power to avoid foreclosure. There are many more options you can consider before taking the radical route. By communicating with your bank or lender, you may find a better solution to your woes, one that is superior to foreclosure. There is that obvious stain to your credit once you foreclose — it goes on your credit report for at least seven years. Once your credit gets hammered, your future loans and credit use become a much more expensive matter (check out how your credit scores affect your loan rates and how interest rates are hiked up for those with unfavorable credit), or worse, this can affect your ability to apply for any form of loan, insurance, employment or even housing! Fannie Mae is cracking down on borrowers who are contemplating on walking away from their obligations. Fannie now mandates that if you foreclose, you’ll have trouble getting another mortgage down the line. It will take you five to seven years before you can qualify for another mortgage through Fannie Mae, or three years, if you happen to have “documented extenuating circumstances”. If you foreclose, you’ll find yourself with stricter requirements in order to qualify for your next mortgage: you’ll need at least 10% for a down payment and a minimum FICO credit score of 680. Other problems you’ll be grappling with if you walk away? You’ll be facing federal income tax issues. You’ll still owe income tax on your unforgiven mortgage loan balance. Whereas if you work out a loan reduction/modification plan with your lender, any portion of your loan that is forgiven may escape tax liability. Once you’ve got a foreclosure on record, future applications for mortgage loans will be scrutinized in much more detail and will be subject to manual underwriting. Your loan application may take more time as your finances go through a microscope. Clearly, foreclosure is one of the most stressful financial situations to be in, but this should really be your final option. Such a huge matter requires careful analysis and understanding of all the alternatives and the effects of your decisions. To those who have concerns about their home loans, I’m hoping this piece is able to provide you with some food for thought to consider as you evaluate your mortgage matters. Interesting. I find it odd that mortgage lenders would agree to lend to people who have no equity in the house and have the option to walk away. Pretty risky business model. I think more homes are going into foreclosure than need to be going into foreclosure. Currently Countrywide is looking at an avalanche of lawsuits over improper procedures, bad record keeping (or no record keeping),and other flagrant violations. Lenders are slow to renegotiate and quick to foreclose. I do think we will need government intervention and soon, or it will get much, much uglier. Thank you so much for publishing this article. I am in a situation where I’ve been considering foreclosing on two houses I own in Las Vegas. Your article has given me a good overview of my options and a better idea of what the consequences would be. Thanks again. I deal with lenders every day and some of the statements are true but there are some gaps that need to be filled. Lenders have tightened the guideline now and if you want a new loan you will require 20% down…. except FHA where they can still do 3% in some cases. THe biggest challenge is even if the lender decides to ‘modify’ your loan you are only putting a band aid on a much bigger problem. lets look: You are in default, you have missed 3 payment @ $2500 and you owe the bank loan to the amount of $250k and the recent sold comparables in the area are $225k. You want to modify or refinance the loan. You now owe more than the house is worth. Re-FI will only refinance up to 70- 75 % MAX most will be 65%-70%. So lets say a magic wand came out and you managed some how to qualify for a re-fi you would get $175k………….. but in order to close and get the new re-fi you would need to put down $75K. NOw if you had $75k my guess is you wouldnt be in default … right? so the re-fi is out. The next thing is a loan modification or a forbearance plan. again you need to qualify. Has the reason for your default been erased, i.e you lost your job and now you have a new one, you fell ill and now you are all better? If the reason for default has not been rectified then they will decline the modification. SO lets say you pass that test and you get the modification adn your new payment is only $1700….. few thats a relief…. but what happend to the rest????? yes the other $800 ? it goes on th eback end of the loan. you still owe it. so after 12 -18 months ( the typical amount of time for a modification) you decide to sell the house and get something else as you know the payement is going to go back up to the $2500 at least. so now you owe $250k for the original loan PLUS $7,500 for the payements you didnt make PLUS $ 14,400 to make up for the reduced payments you have had for the past 18 months. $271k on a house that is only worth around $210k. So in order to close the house you need to bring 70k to the table , plus commissions, plus closing costs which will equate to around another 6-9% which means you need to sell the house at $ 296,371.00 in order for you to walk away without a penny out your pocket. And that aint going to happen anytime soon. what if you the same owe $250k and you are in default. we know you cant sell it for what you owe. what we then do for our clients is negotiate the debt with the bank and get them to take less than what is owed in order to sell the property. with the negotiations we can pay off the house, pay the closing costs, and pay the commissions. you will be zero out of pocket and your credit will not have a foreclosure on it. so you can once again become a home owner later on. this will allow you to move into rental and rebuild your life without the added pressure of having an overleveraged house. we help around 150 homeowners a month. I had to foreclose too in Vegas. I guess reading this puts stuff into prospective so I don’t have to go through this again. 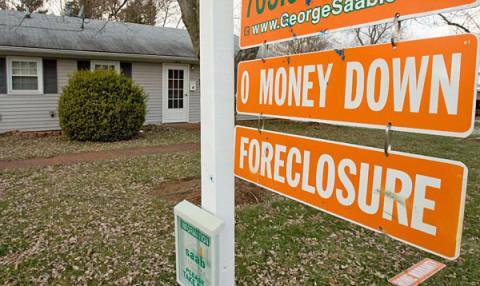 I personally feel foreclosure is something both lenders and borrowers should avoid. Lenders often don’t want to foreclose because of the simple reason that it costs them a lot. As for borrowers, they need to avoid it or else their credit would get a big hit. Also, quite obviously they’ll lose their homes. So, the best thing to do when one is in default, is to approach the lender and request for a foreclosure prevention option when a person is in default. Jessica, I don’t think people worry too much when they are about to be foreclosed on. It normally is the end of the road and it will be a while before they can get back to where they where. Banks just want their money back. Steve makes a great analysis of a scenario that most people fall under. At the end of the day, one should try to avoid letting their house go into foreclosure. It all starts with being able to manage their finances well. Well, the best way to avoid foreclosure is to be prudent in the first place. One might want to check out Zillow or Trulia (or other web sites that do analysis of real estate prices) before committing to a purchase. This way, one will not price themselves out of the property sales market. Ed: Thanks for your comment, I’ve edited it slightly because I don’t allow the use of key words/links in comments. Well, many foreclosure homes need some degree of renovation work. Know ahead of time how much you are willing and able to do before you commit to more than you can handle. Foreclosures are happening left and right but it doesn’t mean the end of the world for you and your personal credit. You can always seek help from professionals in the industry. Can’t hurt. I am not late on my loan at all but I am wondering how to recoup over 100k in equity that was lost with these foreclosures in my area. I feel like it would be a better financial plan to take about 6 months to finally get kicked me out (foreclose) which I would save about $3900 a month = $23k in cash and once I get out and rent a place for about $1900 less and save that each month. So in a year I would have about 35K in the bank. With the economy the way it is cash is king, so why not? Thoughts/Feedback? If you’re planning to foreclose, there are of course, consequences — which is the effect on your credit. You may have a black mark on your credit, which would make it even much harder for you to borrow money way into the future. Either way you look at it, all the home values we had a few short years ago have evaporated. If you can keep up with your mortgage, I wouldn’t recommend walking away from your home right now. You’re simply going to destroy your credit by doing so, and I doubt that’s what you want to do. Why don’t you just sell your house for whatever it takes? You save your credit, take the loss (as you would if you foreclose anyway) and move on. Why foreclose? Duely noted and true but you have to see that your loses can be recouped in half the amount of time or more. Along with seeing how many people that are foreclosing now, FICO scores could be weighed on a bell curve. And if I wanted to get another house I would have a considerable down payment to use for it next time. Just trying to weigh my options and see if there are other alternatives. I just feel like the good people who has done everything right will end up getting screwed in the end by not getting relief on thier homes like the others who put us in this situation in the first place and went into one of thier biggest investments of their lives not prepared and really couldn’t afford property. It just doesn’t feel right to me. I want to start the debate. what are your Feelings and/or thoughts? Am I wrong or short sighted about my thoughts here? I think that the comments suggesting that foreclosure can be avoided by simply managing your money better is short-sighted and ignorant. I bought a house in a gentrifying area of Michigan for 89k-this was cheap even by 2002 Michigan standards-basically, it was a good investment. I put about 30k into it over the course of 6 years and thought everything was going swimmingly…then the market took a dump. My husband is in construction management, he got laid off, there was no work in sight, we moved to Chicago thinking our options would improve and that we would be able to sell our house for a mere 110k. My husband never did find work and so went back to school. Part of the house in Michigan was always a rental and for the first year after we moved, we had a couple of girls living in our portion of the house. Now because no one can sell their homes, there are tons of houses for rent and we just can’t compete. We can’t find renters and can’t sell it and are even trying to sell it for a 10k loss. No dice. I am very good with my money, we used to have a decent retirement account going and for being in my mid-20s, have stellar credit…for now. Between the mortgage, home equity loan and $400 a month in utilities for the entire house, I can’t make the payments without tenants. But oh…this is my fault for not being responsible with money. While I understand that some people have been irresponsible, there are also plenty of honest, hardworking people who have just gotten screwed through no fault of their own. Open your eyes. People around me are getting laid off left and right and I’m just thankful I still have a job. Foreclosure might be my only options if I don’t find tenants soon and it’s not because I’ve been mismanaging my money. I am in a similar situation. The house is in my wifes name and financed only in her name. If we walk away, only she takes the hit. Right? I can go out and qualify or pay cash for a new house and wait out the market. Any comments? I dont know what state you are in but in California (according to my real estate lawyer) yes your credit will stay in tact and basically the new house will have to be in your name instead of hers. Good luck and I hope this helps. My fiance and I are considering foreclosure for her townhouse. I have a house and she has a townhouse. We’ve decided to move into my house because owning her townhouse is not feasible for us and our growing family. She owes 130,000 on her townhouse but others in her development are going for $44,000 – 79,000 with the most recent selling at 65,000. We tried renting it out and had renters until their lease expired 2 months ago. Her mortgage is $1100 and we were only able to get 999 for rent. We are now down to 900 and still haven’t been able to find renters. Why shouldn’t we consider foreclosure. We aren’t going to get the equity back for over 10 years (possibly longer). At what point do we say forget it, it’s not worth it? Any one have any recommendations? If your gut, intuition and peace of mind calls for it, then foreclose. The losses may be too big to recoup after some point and I may just go the route of foreclosure if I end up facing your kind of situation. I am in a similar situation to Doug. I lost my job in AL 5 years ago. Afterwards I was unable to find a job locally with a comparable salary so I relocated my family to Michigan. Being that I have kids & that my wife & I have lived in AL all our lives I made a promise to my wife that we would stay no more than 5 years in MI. While I have loved living in MI it has now been 5 years & is time to return home. I put over $20,000 down & now have about $50,000 in equity. We bought the 30 years old home for over $300,000 in what was considered by Money magazine one of the top 100 US cities to live in thinking it would be something we could easily get out of in 5 years. Recently I spoke with my realtor who informed me I would be doing good to sell it for what I owe the bank. I have never missed a payment but at this point do not see any incentive to wait until the housing market rebounds in the next 2, 5, 10 years or so. Even if we did stay indefinately just to get our money back out of our house there is no guarantee it will ever get back to where it was. So here I am someone who never missed or had a late payment during 11 years of marriage considering walking away. I do not wish to foreclose or do a short sale as my credit score currently is in mid to upper 700’s. I have read about deed in lieu of foreclosure to get the lender to release me from debt however I don’t think they would even consider giving my current situation. If I walk away I could stay at a family house & save $2000/mth. In 2 years I would have back the $50,000 lost in my house or I could continue putting money in a house in a state I don’t want to be in anymore. Plus being that I work for a auto supplier in a state whose economy seems doomed due to all the auto bankruptcies it doesn’t seem to wise to stay put. Is there any option for me or do I have to break my promise & stay in Michigan for who knows how long? I am in a similar situation as Ken. My husband bought a house in April of 2007, right before the bubble burst here. According to comps in our area, we are probably backwards about 30-35%. The banks will not work with us, so we will likely foreclose. I can afford a house with my own income and credit that is actually nicer than the one we are currently in for a lesser payment. We can also save a very sizeable down payment during the foreclosure process. My husbands credit will be damaged but the way we see it, the pros outweigh the cons. Seems with the amount of foreclosures happening these days FICO will consider foreclosure to be a slightly smaller black mark than in times of economic boom. My guess, anyway. I lost my job last April. The next day I called Wells Fargo for help. I told them at best I could easily pay my mortgage for 3 more months. They said because we were in good standing with a 10 plus year relationship with them, that we would go to the top of the list. They spent 4.5 months working out remodification only to come back and tell us that we did not qualify for that and would have to refinance. Now we are trying that but guess what? Our income to debt ratio is now 6% higher, you would think this is a given since we lost one income and are applying for help. This week we learned we have to layout $7,000 in refinancing fees and pay a year’s worth of homeowner’s insurance up front before the refinancing can go through. So here we are, six months later and no resolution yet. So much for the government sponsored program…guess what? After owning a home in Texas for 10 years, selling it, moving here and owning this house for 3 years, we are WALKING AWAY! Everyone wants to talk about the options but no one reports on how those options are so convoluted, being defrauded or withheld for several months in secret hopes by the lender that you’ll get another job and be able to make your payments as usual. What a farce this whole process is. My husband and I have been dealing with Wells Fargo since February 2009 because our note increased $600.00/month in 6months because of a miscalculation on their part for our escrow. We have been denied for the modification because we were not late on our payments and did not qualify for refinance because we have PMI. So we contacted Wells Fargo again in August and they said that the rules had changed and we could refinance under the Home Affordability Refinance Plus but they would require an appraisal. Our appraisal came back $100,000.00 less that our original appraisal two years ago so we were obviously denied to refinance. We have exhausted all efforts to do the right thing and quite frankly are tired of playing with Wells Fargo so we have decided to foreclose. To those of you who recommend not foreclosing because of credit score drop, well our good credit and up to date payment history doesn’t seem to be helping us much. Also we are in a unique situation because my husband is the only one on the mortgage and we have a rental house that we plan to move into. This is our situation: My wife and I have been married for about two years. She’s owned her home since 2003 in NJ, which she purchased for 250k. For the last 6 years, she has not missed one mortgage payment to the bank. However, everything else, credit cards, school(which she eventually paid), hospital bills in collections, car notes, all have been paid either late, or defaulted. I just pulled up her credit score yesterday, and her FICO from all three creditors is about 450-470, extremely weak. Since the last year, my credit has improved, not dramatically, but still improvement. I purchased a usedcar in Jan ’09, as a co-signer to my wife, which brought my score a bit down. Last month, we traded in the used car and purchased a new 2010 model, a fair price, but with solely I as the borrower. My wife’s credit would not allow her to be on another loan. My fico is in the 670 range, not good, but better than hers. She has about 20k in debt, aside from her mortgage which is about 250K, still. Also, she has put about 50K worth of upgrades and repairs to this home in the course of 6 years. We had a realtor come over last month to give us an appraisal of the property to see if it was worth putting on the market. He showed us comp’s in our area, new construction homes, with drive ways, were going for $230. Our home, he said, would only get around $190-210k. We were caught off guard. My wife was hoping for at least 300k, =0). Anyway, considering I’ve never owned a home before, and my credit is improving as time goes by, we are thinking about walking away from the home. The realtor mentioned to talk to our Bank, as for a modification of the loan, and depending what they say or do, decide if a short sale would be appropriate. The bank basically told us, since we’ve never missed a payment, we don’t qualify for modification, that usually works out for people that miss 3-6 payments. Granted, we are going through hardships, I was just laid off and my wife had her hours reduced at work. We live in a two family unit, and collect half of the mortgage payment from the tenants. We were thinking about saving this money for as long as we can (we know people that stopped paying their home’s and still live there after two years of not paying) putting it aside for when its time for me to purchase a home. Also, I will be going to the military soon and will like to take advantage of the VA home loans they have as well. My question is, if we do walk away from this home, considering that we are married, would it affect me as well? Also, considering her credit is already in the black, with many outstanding balances and low FICO score, is it beneficial to stop paying the mortgage, even if she’s never missed a payment? Walking away from your home is almost always the worst decision to make; if you’re absolutely determined to not keep the home, at least be intelligent about it and negotiate a short-sale or ask your bank about a deed-in-lieu of foreclosure. I have been tring to modifiy my loan for 2 years with Countrywide. One year doing it myself and calling every week hounding Countrywide. They told us they would not consider us unless we were behind on our mortgage. Our situation started when we bought our house 4 years ago with a mortgage from BB&T in which we got screwed into an interest only loan at the day of closing. We refinanced to a fixed rate but with a $600 more a payment a month which was difficult. Then the market dropped and my husband lost his job because they went bankrupt (a builder). My husband had his ouwn company on the side but his salary is half of what he was making. We could no longer afford the mortgage payments after we used up all our savings to pay it. I got no where with Country for a year they gave me the run around. Then I used NACA to help me called them and Country every week for a year got no where. Countrywide sent a a foreclosure notice and auction notice. We moved and gave up. The emotional stress was too much for us. I now suffer from tension headaches and depression. We had to file Chapter 13. We were lucky and found a house to rent where they didn’t ask for a credit check. Our rent is $2000 less then our mortgage payment. After we moved NACA called and told us Countrywide was going to modify our loan but at only $150 dollars less, plus there is an escrow shortage of $227.00 a month which would make our payment the same as before. What a joke ! You tell me how we can afford a house at $2800 a month when we only make $60,000 a year. Gee our Bankruptcy Lawyer said we can only afford a payment of $1300 a month. So don’t tell me there is Hope or other options. I hounded Countrywide and NACA did for 2 long grueling years. I will never be the same after all of this my smile from my face is gone. The banks got their bailout what about the American people. I have owned a home most of my life and worked hard, and at 50 what do I have to show for it. Also Countrywide sent us a modification before it was actually a pay back plan for the missed payments. They called it a modification before we received the papers in the mail nothing like false hope. They just love to screw with you. I’m so afraid for my family and my two daughters. I was doing a good a job and i was laid off and then i decided to become self employed (not much of a choice) and took a dramatic pay cut. I’m afraid to foreclose on my home but GMAC is not giving me too much of a choice. I applied for a loan modification back in july (i was already behind 5 months on the mortgage ) only to learn that i did not qualify for a modification. They put me on this 6 mo.trial where i was making payments of $1860 every month so the 6 months past by and i got denied a loan modification due to my self employment situation. I just wished they would have told me earlier so that i could have saved that money. I paid them about $11,000 that I’ll never get back…. Now i’m afraid because all of this time they counted it towards the foreclosure process so now my auction date is feb 1 and i don’t have anywhere to go. What a way to end up!!! I have a friend in California who is working with a bankruptcy lawyer right now to look at his options. Same problem with the house being worth less than the original sale amount. Bankruptcies in California and around the country have become a serious problem. Great Article. There are some great articles at the californiabankruptcygroup.com as well, if you want more info. I am curious why so many individuals are still having their homes go into foreclosure. What ever happened to the Obama Plan? This plan was designed to help keep homeowners in their homes, and not have them lose their homes. Bought a home here in Arizona (Glendale) approx. 1.5 years ago for 345,000 (20%down). Like all other homes in AZ, the value has cratered. Worth around 225K-235K now. Have decided to cease pouring $2,000 dollars a month at a never ending declining asset. Am going to walk away. Just a quick question to those who have been through this situation in AZ (or elsewhere). I ceased making house payments in February 2010. How many months can you remain in your home before the home is auctioned off and you are forced to exit? Want to drag this out as long as possible. Would it help to hire an attorney to assist in dealing with the process? Thanks! In the late 90’s early 2000’s I was interested in making real estate purchases in Arizona (and yes, in the Glendale area, among other places). The prices then were something like $110K to $130K a house. Anyway, that was then, this is now, and you’ve got an entirely different situation. I found this info when I did a google search about how long you can stay in your home after you declare foreclosure. It may apply to a particular state, but it could give some idea as to what you can expect. Hope it helps? You may want to check with financial experts or attorneys in your area about this. Hi Guys this has been very helpful, but I have a question if anyone knows about this, my mom is been trying to sell her house for a year already and its been very hard, she might be thinking on going into foreclosure because she can’t afford the payments anymore, last year she run into some heritage money and she bought a condo in Orlando for retirement, she paid cash $40K, when she goes into foreclosure can the Bank touch her other property? I put $12,000 down on a home 5 yrs ago – payments were $1,300 and I could not afford them after losing hrs at work (single mom). I applied for the loan modification and it took months of paperwork, phone calls and tons of stress. Finally I have new payments of $1,065.00 per month and take home approx $2,200 monthly. I CANNOT do this!!! My mom has MS and needs to move . She had the idea to buy a home that would have an open floor plan for her and My daughter and I could move in with her. I would be able to care for her and we would share the expenses. she would avoid the high cost of assisted living and I would reduce my overall monthly bills (and reduce my ulcers). Problem is that I cannot sell my home. My central AC broke in August, my sump pump broke in Sept and I need home repairs that I can NOT afford. Should I walk away and when do I stop payments. I cannot sell as the value is now $20,000 less that what I owe. Should I save my monthly payments for the move with my mom? Do I continue to pay my taxes and home insurance? Do I tell the NEW mortgage company? I am so upset over this but have no options. This is a win-win for my mother and I (she can not live in my home due to lay out/steps) HELP???? You’ve got an underwater mortgage. There’s a lot of talk about this in this article. I would think that telling your mortgage company about your situation should help. Usually, having an open dialogue with your lender (or creditor) should help your plight. They want you to honor your obligations so if you are finding it to be a struggle, then it is in their best interest to work with you on this. But it also depends on your lender as some lenders are downright dishonest and fraudulent. If you are working with a trustworthy and reputable lender, then communicate with them and seen if they can assist you and help you go on a payment schedule that is less onerous. I purchased a condo about 5 years ago and I have an eighty twenty interest only loan. 5 condo’s in my complex have gone to foreclosure to a quarter of the price that I owe. I can’t refi. and I certainly can’t sell it, hell I can’t even give it away. I did not put my wife on the loan or do not have any joint accounts for the reason that if my credit dumps we have hers to fall on. Any suggestions? Foreclose or not. I wouldn’t foreclose without reading this piece first. Know your options by Fannie Mae may help you out! I have to say this, It is very bad right now. The face of homelessness is changing daily. There are a few of us who will be able to keep up with our debt. We have maintained some kind of health from not eating poorly and have stopped smoking which used to take away even more money especially at $8.00 per pack. We take our lunch from home. We make gifts. I could go on and on. The best thing to do is to get out of your house, suffer the mental and emotional trouble. Grow from it and don’t live beyond your means. The banks need a spanking for making a bad loan and we should have let them fail, period. We should have prosecuted the criminals and let them suffer the consequences and learn from their mistakes. Now does this sound to hard? We should also dump all the homes on the banks and see if they can get us to pay even $300.00 per month for them? 3) The emotional trauma of breaking my promise to pay for my home. Anyone have any thoughts/insights for me? ?